One of the great joys of working at an educational institution is the chance to meet and interact with students, teachers, and researchers from all over the world. At the Burke, that kind of interaction usually takes place when people come to visit us in New York City. But recently I had the distinct pleasure of bringing a little piece of the Burke overseas to the wonderful town of Provins, France. Provins, which is situated a little more than 50 miles to the southeast of Paris, is a town of about 12,000 people. Since 2001, it has been listed as a UNESCO World Heritage Site because of its remarkably well preserved medieval architecture, which includes its twelfth-century walls, a massive fortified tower at the center of the Upper Town, and several beautiful medieval churches. 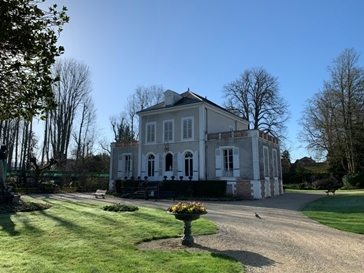 The town is also home to the Fonds ancien et Archives de Provins, the local municipal library and archive which houses, among its many treasures, a magnificent collection of medieval manuscripts and documents. 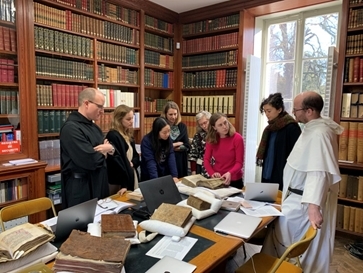 In 2009, Columbia University and City of Provins forged a special partnership, which has given students and scholars at Columbia access to Provins and its many historical sites and cultural artifacts. In the summer of 2010, just after the first year of my doctoral program in medieval history, I had the good fortune to be among the very first researchers to visit Provins from Columbia. I spent three weeks in July exploring Provins’ archive and the manuscripts it contained. 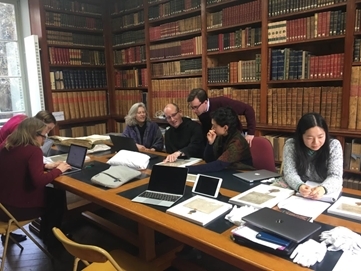 Two weeks ago, after almost a decade-long absence, I had the good fortune to return to that same archive to help lead a special workshop on medieval documents and liturgical manuscripts. Organized by Susan Boynton, Professor of Historical Musicology at Columbia, the workshop brought together eight graduate students past and present (from Columbia and Union Theological Seminary!) who share an interest in the history, music, and religious culture of medieval Europe. Over eight days, we dug into the contents of more than a dozen medieval manuscripts, learned from one another, and shared laughs and a good helping of fellowship over many meals. Jeffrey Wayno (standing) with graduate students from Columbia and Union Theological Seminary (seated) during the workshop. 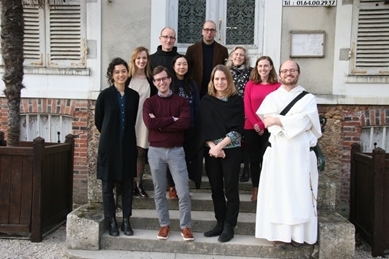 Photograph by staff at the Fonds ancien et Archives de Provins (2019). The entire week in Provins was great success, in large part due to the organization and tireless hospitality of two individuals: Susan Boynton and Luc Duchamp, the longtime director of the Fonds ancien et Archives de Provins. But as the week progressed, I was also reminded how the best kind of intellectual experiences are often determined by the people who take part in them—and how the best kind of learning is often communal—and collaborative—in nature. What made this workshop both special and also productive was the group itself. Yes, our daily work sessions in the archive were always interesting and thought-provoking, simply because of the manuscript material displayed before us. But it was also our conversations over dinner or while walking around town in search of the best almond croissants, that we bonded over our shared love of a remarkable period in history. By the end of the week, our discussions, which were as wide-ranging as they were interesting, flowed freely from the library to the restaurant, from the work table to the dinner table. 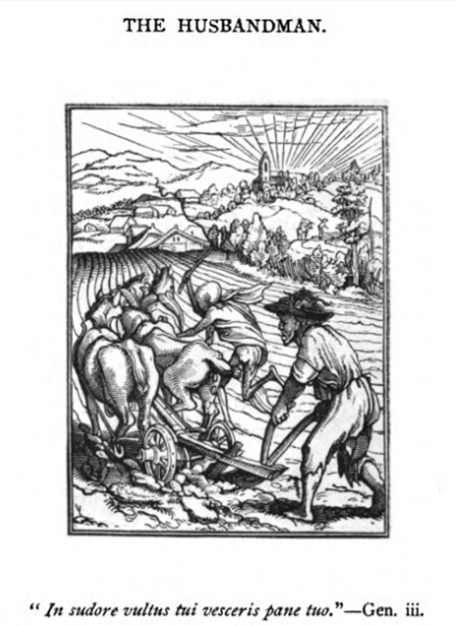 This entry was posted in Archives, Collections, Events, Manuscripts, Rare books and tagged Archives, International, Manuscripts, Medieval, Rare Books, Study Abroad on March 22, 2019 by jmw2202. These images are from a printed collection of woodcarvings designed by the famous Hans Holbein the Younger and carved by Hans Lutzelburger. By chance, I encountered a copy of Dance of Death in the Special Collections of the Burke Library — where I am currently working on Archives-processing projects as a student at Union Theological Seminary — and this unique volume opened my eyes to the world of Holbein’s woodcarvings. “The Husbandman,” from Dibdin, Thomas Frognall, 1776-1847, Francis Douce, and Hans Holbein. 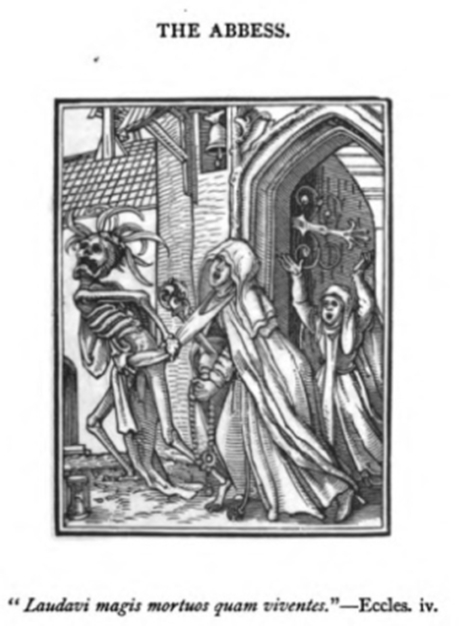 Holbein’s Dance of Death Exhibited In Elegant Engravings On Wood: With a Dissertation On the Several Representations of That Subject. London: H.G. Bohn, 1858. “The Child,” from Dibdin, Thomas Frognall, 1776-1847, Francis Douce, and Hans Holbein. 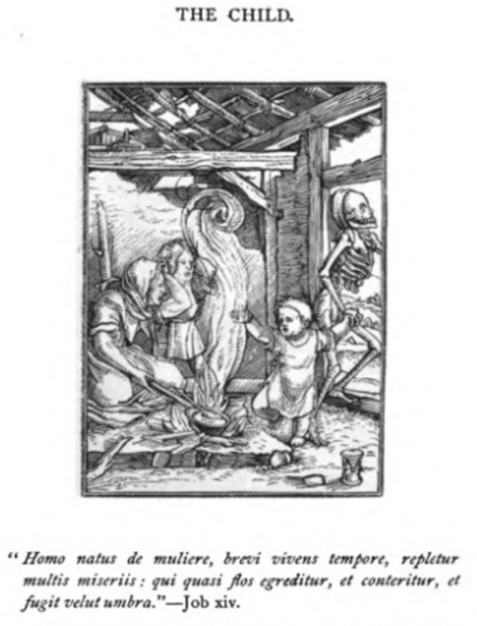 Holbein’s Dance of Death Exhibited In Elegant Engravings On Wood: With a Dissertation On the Several Representations of That Subject. London: H.G. Bohn, 1858. “The Abbess,” from Dibdin, Thomas Frognall, 1776-1847, Francis Douce, and Hans Holbein. Holbein’s Dance of Death Exhibited In Elegant Engravings On Wood: With a Dissertation On the Several Representations of That Subject. London: H.G. Bohn, 1858. Holbien was a 16th century German artist and printmaker who, over the course of his life, did work for Erasmus, Thomas More, Anne Boleyn, Henry VIII, and Thomas Cromwell. After working for More—who resigned over Henry’s desire to divorce his first wife, Catherine of Aragon—Holbein began to work directly for Anne Boleyn, More’s political and theological rival. Holbein was able to weather Anne’s famous downfall and in 1536, the year of her execution, he was officially employed as the King’s Painter. He went on to paint Henry, his third wife Jane Seymour, their child Edward, and many different courtiers. Holbein was also working for Cromwell during this time, creating images for Cromwell’s reformist, anti-clerical agenda. Following Jane’s death, Holbein returned to Germany under commission to paint Anne of Cleaves, the woman Cromwell was promoting as Henry’s next wife. As history has it, Holbein’s picture was highly flattering and Henry, distraught that his wife’s true face did not match Holbein’s picture, divorced Anne and beheaded Cromwell. Is it surprising then that a man who had witnessed and survived some of the most famous intrigues and downfalls in western history, would take as his subject, the fleeting nature of life and the constant, smiling certainty of death? The images in this book depict the Dance of Death, or Dance Macabre, as drawn by Holbein. Dance of Death imagery was popularized long before Holbein, appearing in churches, monasteries, and illuminated manuscripts in the European Middle Ages. Ecclesiastically, Dance of Death imagery—people from all stations and ages confronted and called away by the personification of death as a skeleton—functioned as an allegory urging Christians to repent in the face of certain and, in those days, likely immanent death. Yet, as the essays in this 1858 book by Francis Douce demonstrate, the use of skeletons and stories of dancing death have much longer histories and more complex meanings. Douce tells how, according to Herodotus (a 5th century BCE historian), at Egyptian banquets, a dead body was brought out and presented to all the guests while the hosts proclaimed “Behold this image of what yourselves will be; eat and drink therefore, and be happy” (Douce, 2). Later Romans apparently adopted this tradition at their feasts (Ibid., 3). Thus the face of death can be used to call sinners to the church or diners to revelry. This ambiguity is somewhat captured in the once popular stories Douce recounts in which, though the characters and locations alter in every retelling, some group of people are loudly singing and dancing in direct defiance and mockery of priests, who are trying to conduct a religious service. The priest then asks God to force these dancers to continue their dance without stop for a year. God grants this request and the dancers gradually die, starved and exhausted, dancing themselves to death. Holbein’s woodcarvings seem, to me, located within the space between allegory and ambiguity. Some of the images appear to clearly chastise immoral or corrupt behavior, such as the Judge, who is called by death as he prepares to take a bribe from a from a rich man, or the Advocate, which is similar. Yet others, such as the Husbandman, the Child, and the Abbess, illustrate that death comes for us all, regardless of virtue, age, or hard work. What then is the point of placing an image death before the unjust, as if in punishment, if later images demonstrate the unsettling and incontrovertible fact that death has little to do with justice? Sadly, these woodcarvings, exquisitely crafted and famous though they may be, do no more to answer that question than the mountains of philosophy and theology that came before and since. Therefore, in lieu of an answer to this question, I will leave you with my favorite image from the set: the Nun, kneeling in prayer, yet still able to cast flirtatious glances over her shoulder at the lute player in her room. Though this image was perhaps meant as a warning or a satire against the Catholic Church, I see it as the perfect marriage between the ancient Egyptian and European Middle Ages imageries of death. If life is fleeting and uncertain, why choose between prayer and merriment? Get it, girl. This entry was posted in Archives, Collections, Rare books, Student Entry, Student projects and tagged Holbein, Rare Books, woodcuts on March 16, 2018 by Carolyn Bratnober. 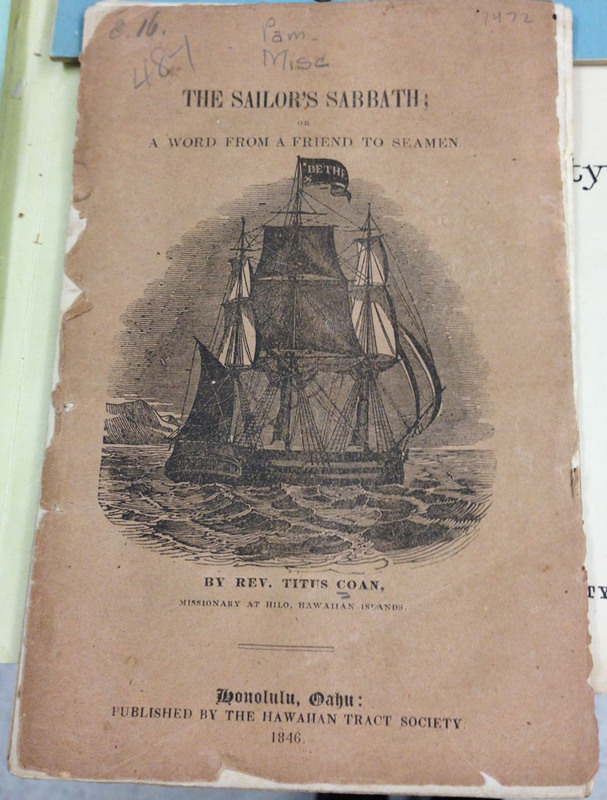 Recently while researching for MRL10: American Home Missionary Society Records, I had to pull some material from the MRL pamphlet collections. 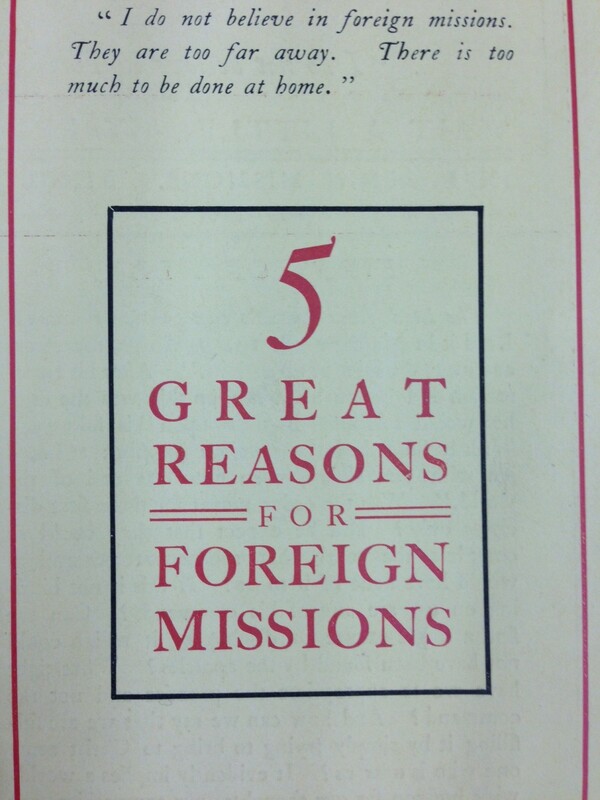 The MRL pamphlet collection, which has been individually item-level cataloged and is available in CLIO, contains over 30,000 missionary reports and other publications. 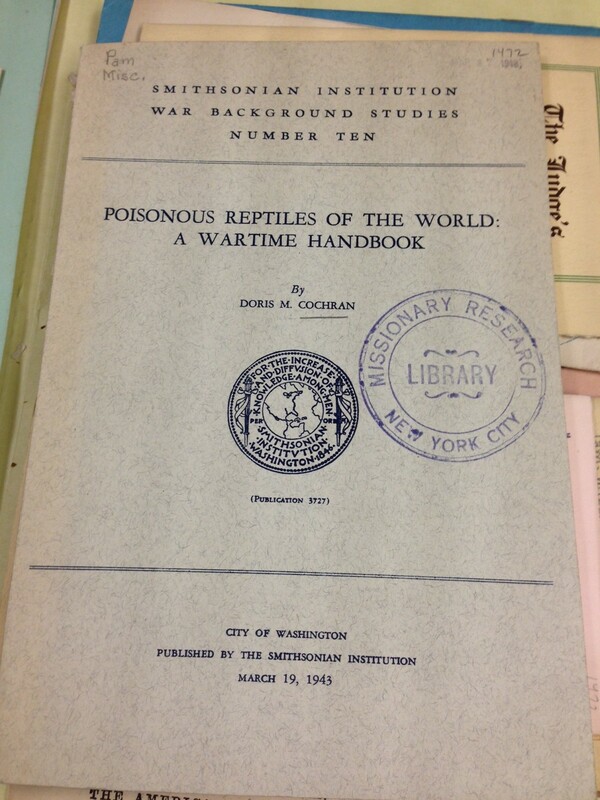 Many of these pamphlets are primary source materials and can often be valuable for the information contained within. All of the pamphlets are non-circulating, but they can be requested and reviewed during Special Collections hours. To do so, please fill out our Rare Books & Archives Request Form: http://library.columbia.edu/indiv/burke/materials_request_form.html. 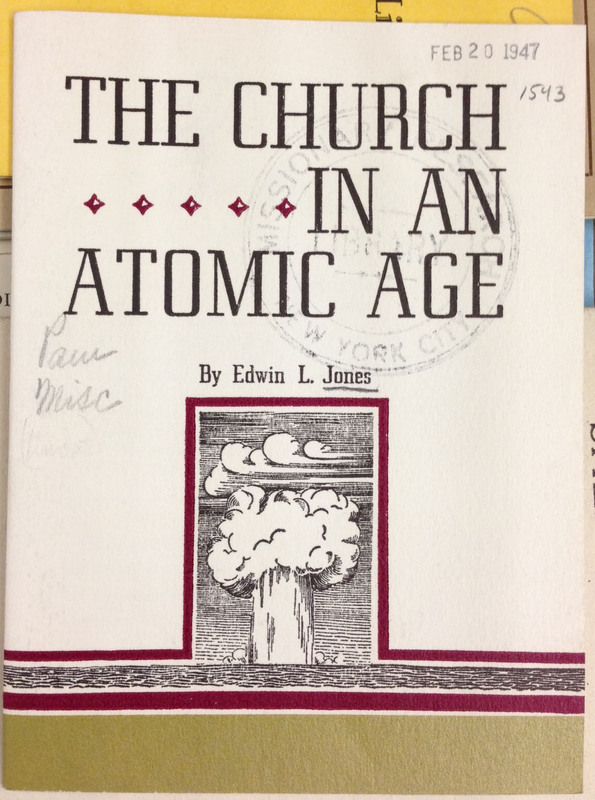 This entry was posted in Collections and tagged Archives, MRL, Pamphlets, Rare Books, Special Collections on December 20, 2012 by Brigette C. Kamsler.